A personal sawmill is small and portable which you can operate on your own or with the help of one more people. It is helpful to turn logs into lumbers for buildings or furniture. The best thing about a portable sawmill is that you can take it to the remote area where transportation of the big log or tree is difficult. This article will introduce to you the top picks for best portable sawmill of 2019. Granberg is a US-based and family-owned business. They have been in the industry for over 60 years and is still the leading name. The company sells their products to customers all over the world. With this Granberg mill, your chainsaw will become a portable sawmill. It is light and compact for personal use. 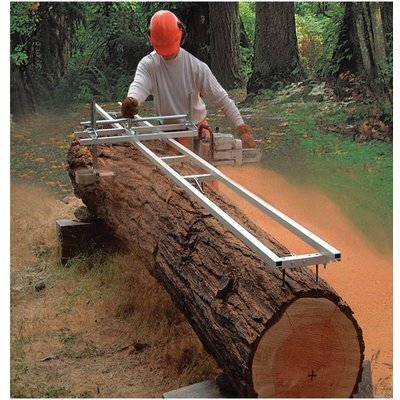 It is easy to bring the chainsaw mill to a fallen tree, assemble and have lumbers in a short amount of time. Model G277 can make cuts up to 18 inches wide and 0.5 – 13 inches deep. The mill works with gas chainsaws that have bars of 16 – 20 inches. The recommended power is at least 50cc. But I would suggest a chainsaw of more than 60cc. The manufacturer recommends this sawmill with their ripping chain. It ensures a long lifespan, faster and cleaner cut, and smoother surface. 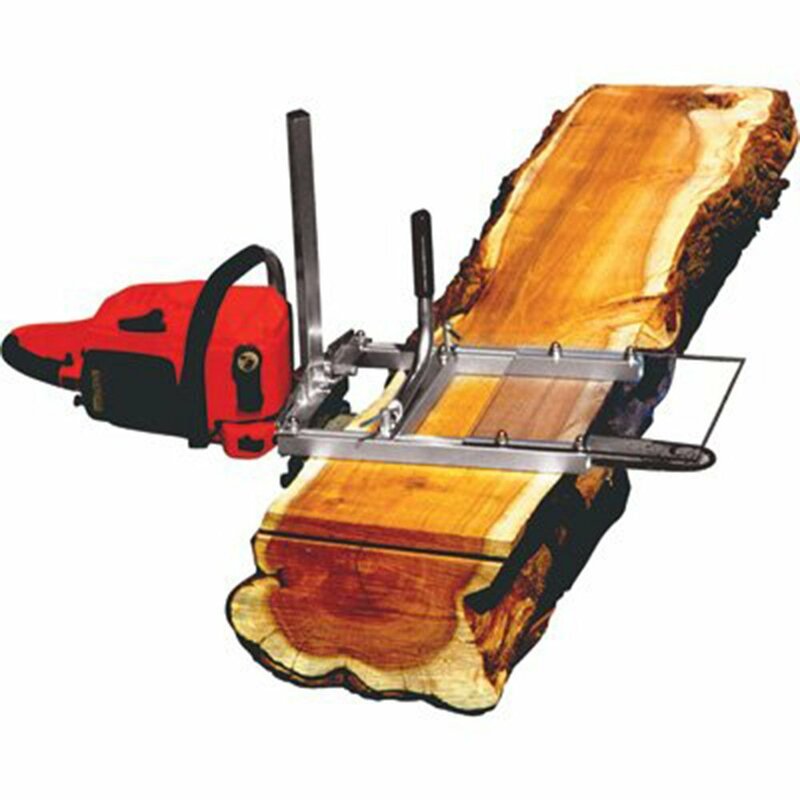 However, any chainsaw that matches above criteria works well with Granberg Chain Saw Mill, Model# G777. The G1085 EZ Rail Mill Guide System is another product from Granberg. It is a component for of a system to make your own lumbers. The aircraft aluminum rails accommodate all mill sizes. The rails make sure your cuts are smooth and on point. It is especially necessary to perform the first cut. As a rail and guide system, G1085 helps you to keep the cut straight and the thickness the same all the way. It also decreases the weight you have to carry on your arms. The system is 5 ft. long with 2 crossbar kits. There are also leveling screws, and log dogs included. For longer logs, the rails can easily connect with other rails to match the length needed. 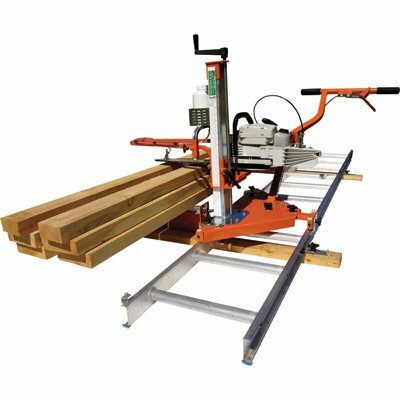 It works well with a chainsaw and sawmill like other items in this article for a straight and clean first cut. After the hard first cut with EZ Rail Mill, it is easy to move on with the next cuts. It would be nicer if the rails are longer; however, it is pretty easy to lengthen the rails. The MK-III Alaskan Chainsaw Mill belongs to the Alaskan product line from Granberg. It is suitable for cuts of 0.5 – 13 inches thick and up to 27 inches wide. It is a part to form a portable chainsaw sawmill that you can bring to the place of the log. Model G776 available in 3 sizes: 24-inch bar, 30-inch bar, and 36-inch bar. You can choose which one fits your chainsaw. The mill easily clamps onto the chainsaw with a bar wrench. The assembly takes around 15 – 20 minutes to complete. If the Model G777 is suitable for logs under 18 inches wide, this G776-30 can slabs 27-inch-wide lumbers. I would choose G776-30 if I often cut logs larger than 20 inches. Otherwise, G777 is a good option. This MK-III sawmill works well with a chainsaw of 70cc at least. Norwood PortaMill Chain Saw Sawmill is a product of Norwood Industries Inc. They have been in the sawmill industry for more than 25 years. Their products are present in over 100 countries in the world. This PortaMill is the most portable sawmill in their portable sawmill line. The sawmill is easy to setup. It takes around 15 minutes to assemble or disassemble the system to use or to store. PortaMill operates thanks to hand-push feed system, which makes its simple to work with. The manufacturer recommends ripping chainsaw of 50cc at least for small to mid-size logs and 65cc at least for mid- to large-size logs. It can mill logs up to 14 inches wide. PortaMill can also work as a band sawmill to cut 2-inch or 1-inch lumbers. Although PortaMill from Norwood can’t cut logs as large as the two mills from Granberg above can, it has the advantages of making the small lumbers with more precise. One more notice is that if you are going to buy this sawmill, check the package and paint before you accept the item. A sharp chainsaw allows you to cut faster, smoother and cleaner. You don’t want you lumbers to have a rough and broken surface caused by a dull one. Before you start milling, check all the bolts, nuts and fasteners. If there is any loose one, fasten them immediately. An undone connection can hurt you badly. Wear your work clothes (glasses, gloves, apron, hat, etc.) before you start the saw. And always focus while milling. A second of distraction can be very dangerous. 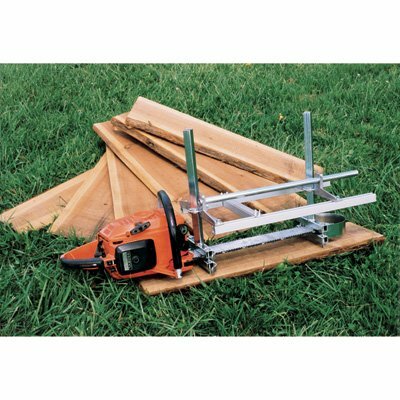 A portable sawmill is a must-have item for any woodworking enthusiast. It is a tool that you can bring to the place of a log or a fell tree to make usable lumbers for your house, furniture, and other building. The best portable sawmill is the one that meets your needs and ability. Share with us which one you have chosen to accompany you in your DIY projects.